Musk, who is the chairman of SolarCity, was a co-founder of Internet payment system Paypal. But he's perhaps best known as the founder of electric car company Tesla (TSLA), which makes what Consumer Reports called the best car it ever tested. That would be the Model S, for anyone who missed it. Poor Tim Cook. It's not like Apple's products have fallen out of favor... at least not as much as the stock. Shares of Apple (AAPL) are down nearly 40% from their all-time high above $700. One die hard Musk fan was pining to get in on Musk's privately-held space exploration and transportation company, SpaceX. $SCTY When will they give us SpaceX? I will be getting in on Day One! Not everyone was so bullish. Some traders pointed out that SolarCity has been heavily shorted and that the rally is being driven by investors buying back shares to cover those bets. Overheard: "$SCTY, best short EVER". #SlapsHead. Shares of SolarCity have been on a tear in the past few months, more than quadrupling in value since debuting on the Nasdaq in December at an IPO price of $8. 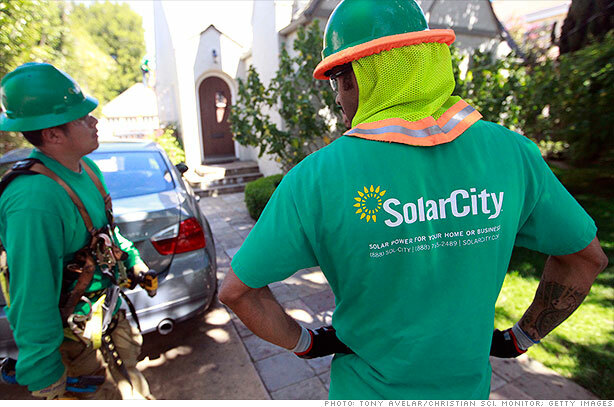 With the shorts being squeezed out, some traders see more upside for SolarCity. $SCTY Sell off done, ride this! For one other trader, the Musk trade works in mysterious ways.